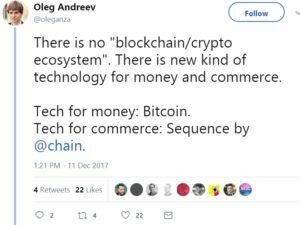 Note: regarding Chain.com, employees are still talking about Bitcoin and Sequence on Twitter, not much about enterprise DLT. See below for an example of some odd maximalism by one of their developers. Shares of retailer-turned-bitcoin-play Overstock.com rocket higher after Morgan Stanley reveals stake (CNBC) unclear why Morgan Stanley would invest in them, when was the last time you purchased something on Overstock? SunTrust joins Zelle (Finextra) anecdote: i used Square Cash this week but not Zelle (incidentally it was for lunch, and the guy paying didn’t have Venmo either). Vanguard applies Symbiont smart contracts to improve index data distribution (Finextra) still unclear how big a deal this is relative to say, what DAH is doing with ASX or what Axoni is doing with DTCC and others. We use blockchain to manage and transfer large amounts of data between a consortium of government agencies. (AWS for Government) there are a few slides pictured in the tweet from Chromaway’s presentation. Here’s a video from that event. A source involved said 9 banks are involved in Digital Trade Chain (vendor is IBM) and they’re looking at other uses (such as supply chain management). DCI will begin to license parts of their CBDC toolkit next year. The team has been heads down working on a fork of Bitcoin and Lightning. They charge about $1m per year but that is just for research, not for the IP. According to a source: two medium-sized DLT vendors recently pitched their tech for retail CBDCs to central banks but since the platforms are closed source the central banks are not very receptive.